About company:YOO.MEE is famous and noble brand which registered in US, YOO.MEE's designers focus on the smart home products development and manufacturing, YOO.MEE team are committed to optimize the life of people from daily anxiety and pressure. We invite and appreciate you can join together with us by YOO.MEE's products. Thank you! 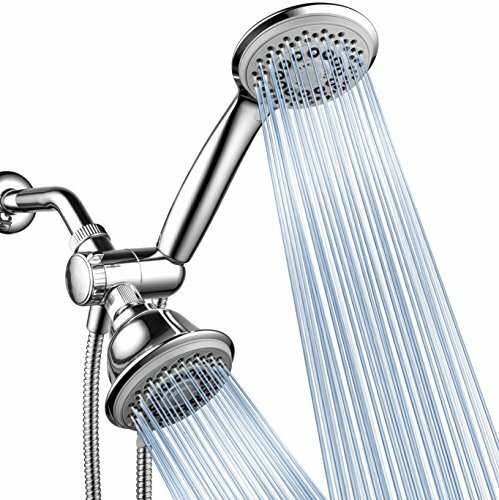 WHY SHOULD YOU CHOOSE FEELSO SHOWER HEAD? Oversize 9 inchs face water flow coverage and rub-clean jets for easy cleaning. Adjustable Swivel Ball make it easy to change the angle of the shower head. One-hand operation, allows you hold hand shower and switch flow settings with the same hand. Makes it easy to change from one setting to another. Rainfall shower mode for the overhead shower head and 3 shower settings for the handheld shower head of Raining Mode, Massage Mode and Mixed Mode meet all your shower needs. 60 inches/5ft maximum reach with solid brass conical nuts for easy hand tightening and reliable leak-free connection. Universal 1/2" Connector, No Leak, No Weak Pressure, No Clogging, No Rusting and No Bursting. Warm Tip: there are three spray modes for this shower system - waterfall top spray, small hand spray and hand+top dual spray. Simply switch the diverter to get the favorite mode you like. The 3M glue((included in the package) is a standby for you to re-stick the bracket. If the bracket is not adhesive enough or you want to move to another position, just stick the 3M glue with bracket to a clean and dry wall surface. PREMIUM HIGHT PRESSURE SHOWER COMBO Engineered with robust ABS and premium chrome finish show you Ultra-Luxury design. 66 silicone nozzles shower head and 55 silicone nozzles hand held shower blast out water at an incredibly high pressure flow rate. ADJUSTABLE RAINFALL SHOWER HEAD Extra Large 9 Inches face with 66 silicone nozzles for wider water flow coverage. Rub-clean jets is easy cleaning and anti-clog. 360 rotation angle-adjustable solid swivel ball joint nut for reliable leak-free connection and different angle position shower needs. HANDHELD SHOWER WITH PUSH BUTTON FLOW CONTROL Large 4.7 Inches face hand hold shower head for wide water flow coverage. Revolutionary push-button flow control for one-hand operation. No dial to turn, you can hold hand shower and switch flow settings with the same hand. Enjoy 3 shower settings of Raining Mode, Massage Mode, Mixed Mode with a convenience push of a button with your thumb. 5FT STAINLESS STEEL HOSE Offers superior flexible and longer reach hose than other hand showers. It is ideal for Bathing Kids, Washing Pets and Cleaning applications. 1/2 connector fit for any universal shower arm. Solid brass metal Hose Nuts, filter and washer insure reliable leak-proof connection. EASY INSTALLATION IN MINUTES No need to call a plumber - Simply remove your current shower head and replace with the FEELSO shower head to any standard shower arm. No tools needed, tighten by hand. Powerful functions of handheld shower head set stands out with high quality construction, anti-clog and anti-leak design, modern looking and contemporary style. You will enjoy solid performance and Lifetime Warranty. Adjust the brass swivel ball joint of shower bracket, for maximum comfort angle. Please install the hand shower according to the steps of the installation diagram. Make sure to put the rubber washer into each nut of the shower hose and connect the hex nut of hose with the bracket. Incorrect installation could cause leak or make shower head can't fit the bracket. When put shower head on the bracket, from the top down. When take shower head out of the bracket, from the bottom up. No tools are required, but if tightening with a pipe wrench place a piece of cloth over the pipe and turn just a slight turn. Over tightening can damage your shower head, bracket or shower arm. The 2.5 GPM Flow Restrictor can be removed using tweezers as needed during lower water pressure or in pursuit of stronger water flow. Easy Installation Installs handheld Adjustable shower heads with hose in minutes for the bathroom, without plumbers or tools. It fits any standard shower arm. 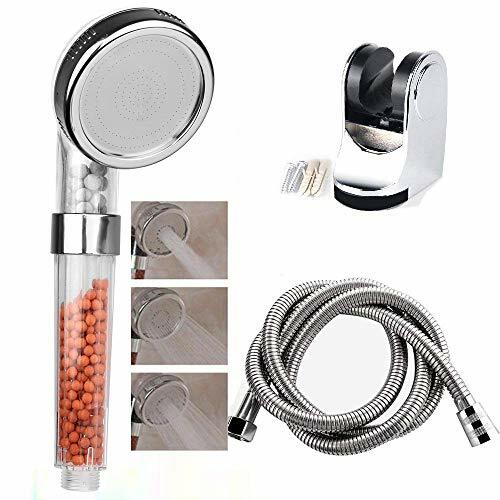 Multifunction Design Luxury hand held shower heads with hose have five different functions and angle-Adjustable brass swivel ball bracket, let you and your family enjoy the relaxing shower experience. 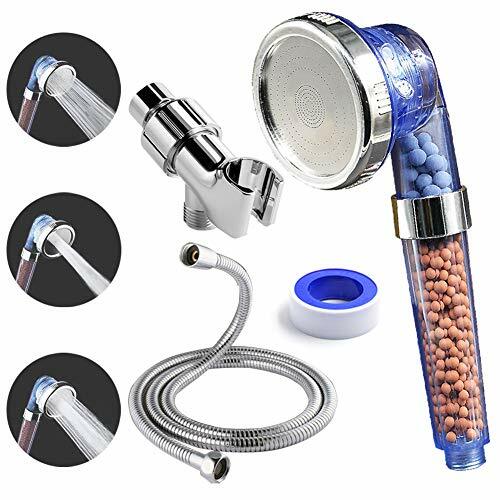 Advanced Material High quality ABS plastic material, elegant chrome plated surface and self-cleaning medical TPE nozzles make high pressure handheld shower head lightweight, durable, lead-free non-toxic, to ensure your shower safe and comfortable. 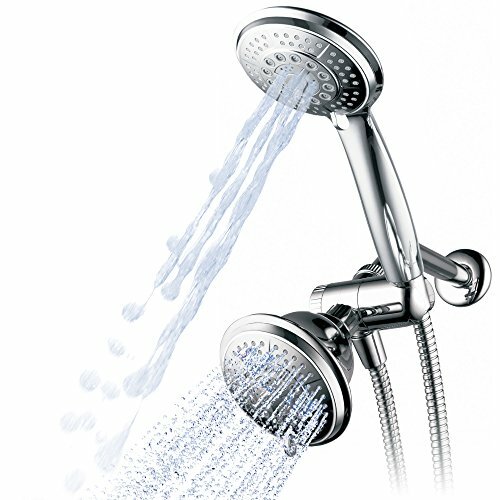 Extensive Use The handheld showerheads for the bathroom are suitable for bathing young kids or washing pets, etc. Lifetime Warranty If you have any dissatisfaction about our handheld showers, welcome feel free to contact us via Amazon. Before buying, please confirm that you buy handheld shower from 'Ai-Beauty' store, we can't guarantee the quality if you buy it from other seller! 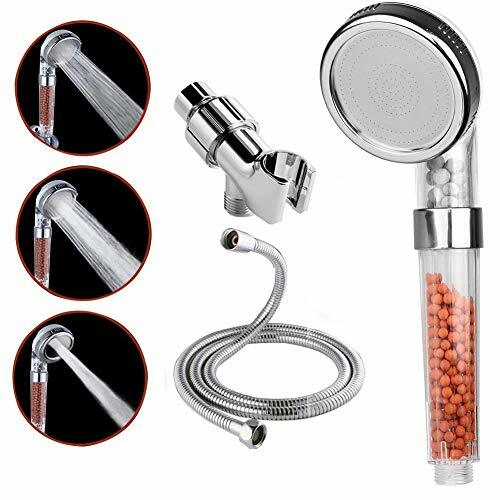 Shower Head and Handheld Shower with Hose 3 Way Combo - Choose from 24 full and combined water flow patterns 5 Full Setting High-power Shower Head and Hand Shower. 5 settings include: Power Rain, Massage, Rain/Massage, Water-Saving Economy Rain, and Pause Oversize 4 Chrome Face 3-zone Click Lever Dial. Rub-clean Jets Patented 3-way Water Diverter with Anti-Swivel Lock Nut Angle-adjustable Overhead Bracket. 5 ft Super Flexible chrome-finish Hose Conical Brass Hose Nuts for easy hand tightening Tools-free Installation. Warranty: Limited Lifetime Warranty. Interlink Products International, Inc. (the Company) warrants to the owner of this product that the product is free from defects in material or workmanship. If this product malfunctions or becomes damaged, stop use and return it to the Company for examination and/or repair. The Company will repair or replace any of this product's parts that exhibit defects in workmanship or materials for above stated period from date of purchase. If malfunction occurs, please contact the Company to obtain an RMA (Return Merchandise Authorization) number from the Customer Service Department. This warranty is void if the product has been purchased from an unauthorized distributor. Oxygenic 26781 Hand Held Sprayer Kit. Powerful Oxygenic setting amplifies existing water pressure and widens coverage. Easily control the flow of water with the push of a button. Designed to achieve maximum performance with tank size and pressure limits. AquaStorm by HotelSpa 30-setting SpiralFlo 3-way Luxury Shower Combo (hand held shower head and overhead shower head) - Use two Showers Heads separately or use Showerhead and Handheld Shower both together for a choice of 24 full and combined water flow patterns! 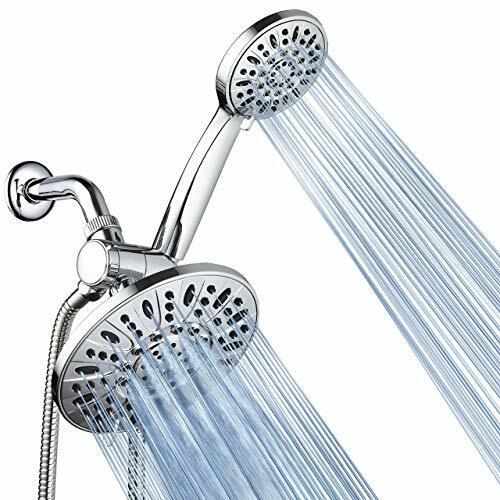 INCLUDES: 4 Rain Shower Head and Hand Shower 3-way Diverter with built-in Bracket Shower Hose Washers Plumber's Tape Installation Manual and Warranty. Sophisticated upscale look for a perfect gift. Creating amazing water experiences is what we do every day at Methven, and have done since 1886. Today, Methven is world renowned for beautifully designed, award winning showers, taps and valves. Over the years, we have learned how to harness the power of water to cleanse, calm, refresh and invigorate. And it s this expertise - combined with our passion for design and innovation - that fuels our ongoing mission to create amazing water experiences, just for you. Aurajet patented technology delivers a full-bodied spray with maximum body contact and all-over warmth. Most advanced, most invigorating shower experience ever, that turns conventional showering on its head. 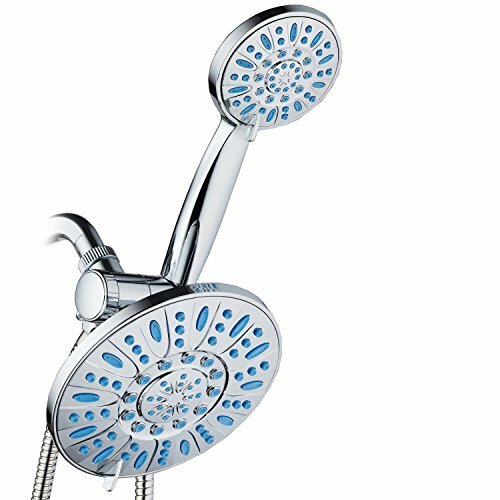 A highly efficient, luxurious showering experience, delivered in a unique halo-shaped showerhead. The Rua collection is designed and manufactured in New Zealand. Taking geometric styling and softens the appearance with slightly rounded edges for a truly unique and contemporary look. This product is covered by a lifetime warranty. Creating amazing water experiences is what we do every day at Methven, and have done since 1886. Today, Methven is world renowned for beautifully designed, award-winning showers, taps and valves. Kiri Collection is based on Satinjet patented technology. Unlike conventional showers, Satinjet uses unique twin-jet technology to create optimum water droplet size and pressure, with over 300,000 droplets per second. The result is an immersive, full-body shower sensation that transforms your regular shower into an experience like no other. Kiri collection combines beauty and practicality with water-saving technologies built in. The answer for lovers of clean lines and strong, dynamic forms. This solid architectural style makes its presence known in your bathroom and kitchen, but not on the environment. Ultra wide coverage. A full-bodied soft spray for all-over warmth and maximum body contact. Great ergonomics and design - clean lines and strong, dynamic forms. Showerhead has swivel joint for directional spray. All pressure design. Suitable for all water pressures above 10kPa/0.1 bar. Q: How to install your shower head? Q: How to replace the beads? We suggest you replacebeads every 6-8 weeks according to the different water quality. You can search B076TZ5LKH to get"Replacement Mineral Beads"
SPECIAL MINERAL BALLS - The infrared mineral stone andnegative ion mineral stones make up double filter systemprotecting you reducing chlorine and absorbing harmful substances in the air, softens and purifies shower water to make your skin and hair smoother and softer. GENERAL SIZE - Easy to install, general size G1/2'' fits any standard size hose.Without tools and a handyman, allows you to install the shower head as easily and freely as screwing in a bulb by yourself. 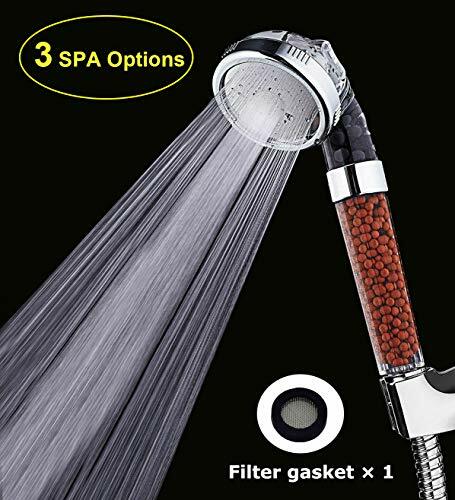 THREE SPRAY PATTERNS - Rainfall, Jetting, Massage, three shower modes filters shower head to bringyou the bestshower experience in your bathroom. ECO-FRIENDLY - Save water & highpressurewith steady water flow,up to 30% water saving and 200% water speed increasing beside ordinary showerhead. SOLIDAND DURABLE DESIGN - Solid build, no leaks. The design of a transparent high-density filter and the perspective are easy to disassemble to clean. 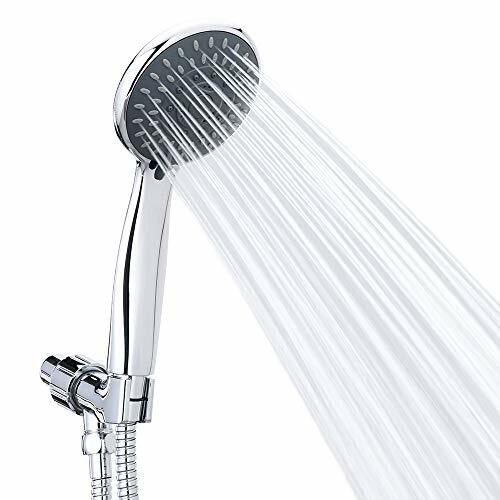 Chrome Finish 28'' Drill-Free Stainless Steel Slide Bar Combo with 7'' Rain Showerhead, 6-setting Hand Shower and Revolutionary Low-Reach 3-way Diverter For Easy Reach. Dual Shower Head Spa System. 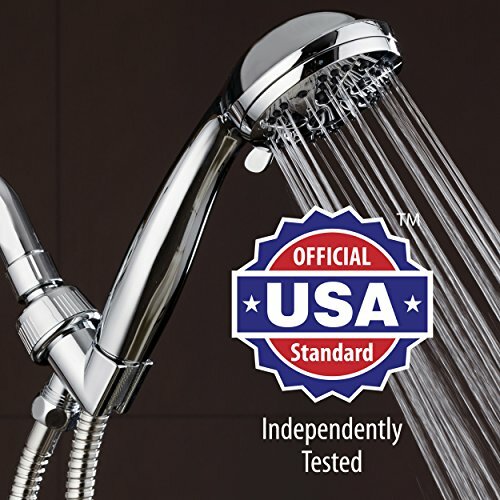 New All-Chrome finish 28-inch Drill-Free Stainless Steel Slide Bar Combo with 7-inch Overhead Rainfall Showerhead, 6-setting Hand Shower and Revolutionary Low-Reach 3-way Water Diverter For Easy Reach. The Ultimate Dual Shower Head Luxury Spa System that's Totally Adjustable to Your Height and Mobility Needs! Patented Heavy-Duty 28-inch 3-in-1 Rainfall Shower Slide Bar System Mounts Instantly, No Tools, Plumbing, Drilling or Wall Damage! Revolutionary Low-Reach 3-way Diverter positioned at the lower end of Slide Bar provides easy reach for switching water flow to either shower head or combined use. New All-Chrome Finish 28" Drill-Free Stainless Steel Slide Bar Combo with 7" Plastic ABS Rainfall Showerhead, 6-setting Hand Shower and Revolutionary Low-Reach 3-way Water Diverter For Easy Reach. The Ultimate Dual Shower Head Luxury Spa System that's Totally Adjustable to Your Height and Mobility Needs! 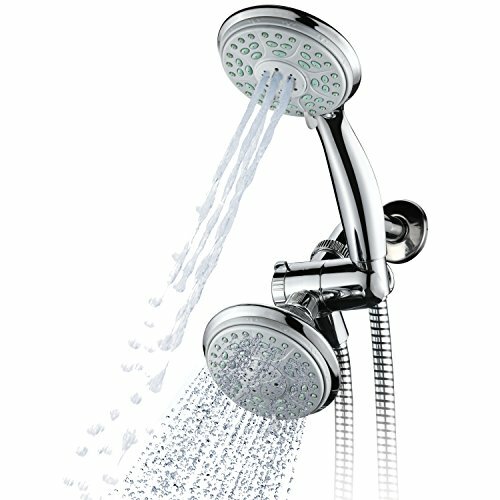 Both Luxurious Showers can be used Separately or Together and feature Advanced High-Pressure Design, Rub-Clean Jets and All-Chrome Finish Settings include: Overhead Rainfall, Power Rain, Pulsating Massage, Hydrating Mist, Rain/Mist, Rain/Massage and Water-saving Pause mode Patented Heavy-Duty 28-inch 3-in-1 Rainfall Shower Slide Bar System Mounts Instantly, No Tools, Plumbing, Drilling or Wall Damage! EASY TOOL-FREE CONNECTION: No need to call a plumber - installs in minutes with just three hand-tighten connections. Fits any standard shower arm. BEST LIFETIME WARRANTY: Hassle-Free US Limited Lifetime Warranty with LIVE customer service representatives in US. FIT MOST SHOWERS. MUST HAVE MINIMUM 30-INCH WALL SPACE BETWEEN OVERHEAD SHOWER ARM AND MIXER. Why choose our shower head? The Chrome Shower Head and Flexible Shower Hose with On/Off Pause Switch provides you with an optimal shower experience. 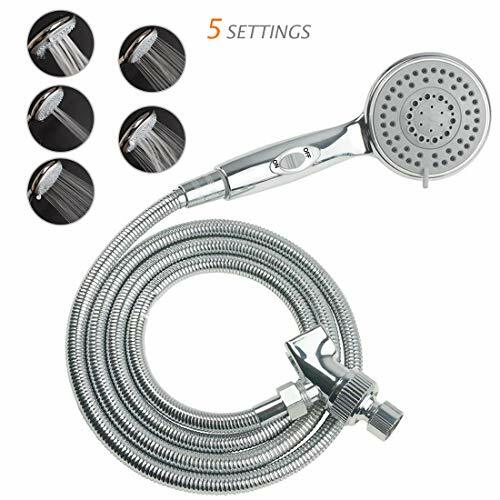 Update your bathroom with this stylish and functional 5-Setting Spiral Handheld Shower Head with On/Off Pause Switch and 6.5 feet Hose in Premium Chrome finish. Fits any Standard Shower Fixture:Fitted with universal connections, the HauSun handheld shower head easily fits any standard shower plumbing fixture. 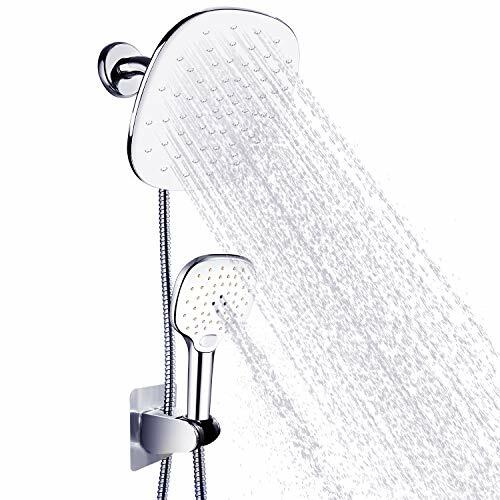 The shower Head with On/Off Switch allows you to enjoy longer showers with this ergonomically designed.Handy on/off switch allows you to pause water flow while shampooing, greatly reducing the amount of water used. Tool-Free Installation: Handheld shower head is 4" in diameter and comes with brass hose nuts for easy hand-tightening and Teflon plumbing tape for added convenience. The transition to a convenient handheld shower head is quick and hassle free. FITS ANY STANDARD SHOWER PLUMBING: Universal connections allow the HauSun handheld shower head to easily fit any standard shower plumbing fixture. FLEXIBLE, EXTRA-LONG HOSE: Easily showering on a stable shower chair, bathing children or even pets, the tangle-free stainless steel shower head hose is 6.5 Feet in length, allowing maximum flexibility and convenience. SHOWER ON OFF SWITCH - Handheld shower head with on/off switch allows you to pause water flow instead of turning the faucet off while shampooing, avoid water waste. MULTIPLE SPRAY 5 SETTINGS: Versatile shower head features 5 spray modes including saturating spray, massaging spray, bubble spray and two combination sprays: saturating and massaging, and saturating and bubble. HASSLE-FREE INSTALLATION: Everything is included for easy installation. Handheld shower head is 4 in diameter and comes with brass hose nuts for easy hand tightening and Teflon plumbing tape for added convenience. The transition to a convenient handheld shower head is quick and hassle free. Enjoy luxurious Spa experience with ASPIOR high pressure ionic filtration shower head! The ASPIOR Vitamin C Shower Head is a powerful shower filtration system for your bathroom, designed to remove up to 99.9% of chlorine, fluorine, chloramines, sulfur, sediments, and heavy metals presented in hard water such as lead, chrome, copper, magnesium, and iron. Our shower filter softens your water, dramatically improves your hair, skin, nails condition as well as helps with hair loss and skin dryness. 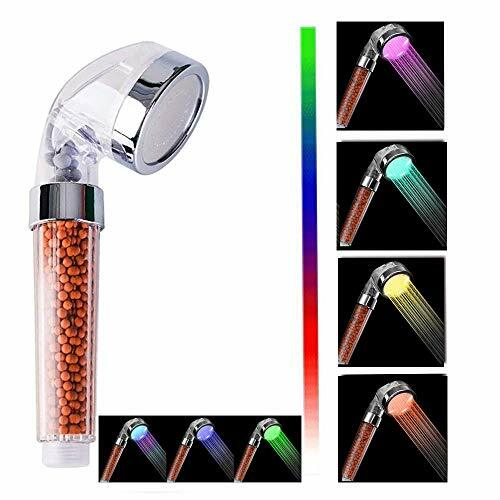 Shower head purifier is made of abs plastic wand and 3 parts - scented filter cartridge, negative ion balls with tourmaline stone and zeolite mineral stones. Renewed Vigour: Our shower head filter accessories are equipped with lemon balm, which could effectively remove sweat odor, improve hair loss, dry scalp, remove itching and dandruff. The soothing citrus scent revitalizes the senses, relieves stress, and improves mood and sleep quality. Easy to Install: Connected to any standard shower arm just in a few minutes without any tools. Suitable for any standard shower, including wall-hanging, double-spray, combined, fixed, rain-falling and hand-held shower. 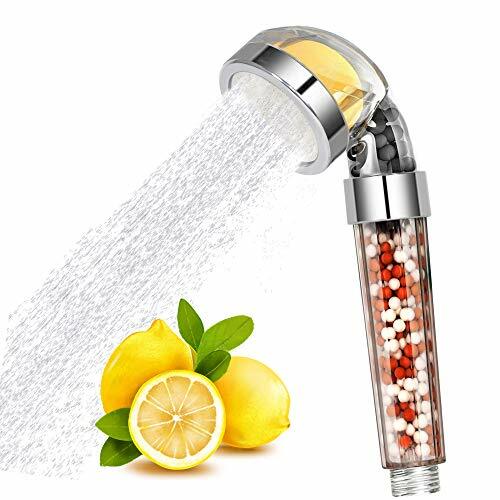 Water Filter: Our water-softener handheld shower filter could remove chlorine, fluorine, chloramine, ammonia odor, sulfur, sediment and it could soften water by filtering up to 99.9% of lead, chromium, rust, iron and heavy metals. 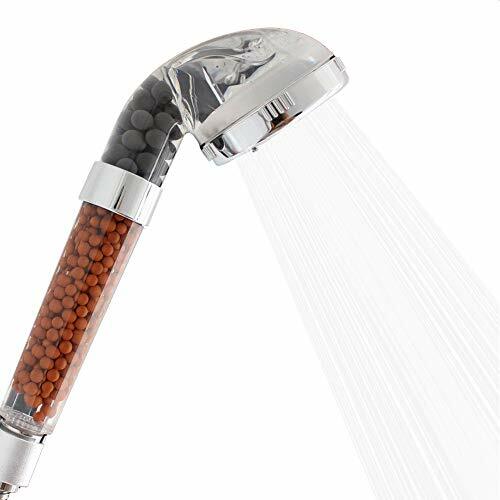 High pressure shower head The water pressure is high up to 2.5GPM, which could make you immerse in a stable, powerful body shower, effectively remove fatigue, bring the ultimate shower experience. ENJOY A COMFORT AND LUXURY SHOWER AT HOME-New high pressure ionic filtration shower head,increase the activity of the water,and provide you with soft&good water,which could help you release the itchy feeling of dry skin,reduce the split hair,Get smoother skin,reduce oil secretion,increase cell viability,improved cleaning effect and hair loss prevention.Enjoy Spa experience with high pressure ionic filtration shower head!Unlike other product which have a close to 90 angle,The New Ionic Shower Head has a curved head which allows the spray to flow in a more vertical direction.The injection angle is more reasonable.The head is detachable but no longer separated,reducing the water leakage coefficient. 1.Water rinse or Use dishcloth to wipe the metal panel to reove dirt after twice or 4 times shower which depen ding on the purity of the water. 2.You can also change the Anti-scale panel,which is easy to squeeze the nozzles to remove the lime or sediment from showerhead. 3.How often to replace the beads? How to replace the beads? 1.Hold the shower head and unscrew the sealing cap counterclockwise. If you need a hose and shower head bracket? ULTRA COMFORTABLE EXPERIENCE:Rainfall,Massage,Jetting-Three shower patterns,each mode is a special shower experience for you.Easily switch between modes that suit your moods by flicking the handheld showerhead rocker switch. GOOD SHOWER ENVIRONMENT: All-natural Bio-active Stones provide Eco-pure Water Filtration,Two layers filter can removes chlorine and odor from your shower water.Keep water's pH Balance.It also makes your skin and hair smoother and softer by purifying the water and softening it-a Comfortable SPA experience in your own bathroom. HIGH QUALITY DURABLE:Made of eco-friendly PC materials,eco friendly.features a transparent, see-through design and high-density filter.Innovative removable design,That's removable for easy cleaning,NO blocking.Head integral design avoids leakage and shedding. SAVE WATE&HIGH PRESSURE:Through the pinhole and LUV throttling technology,Save more water while showering under normal water pressure. Advance Turbocharged technology increases water speed pressure up to 200% beyond typical faucet pressure. ENSTALLATION & WARRANTY:Adopt a common standard connector G1/2,its almost 99% of shower hoses,No need to call a plumber,all connections hand-tighten. (100% SATISFACTION GUARANTEED)From the purchase date within one month of free replacement,One year warranty. 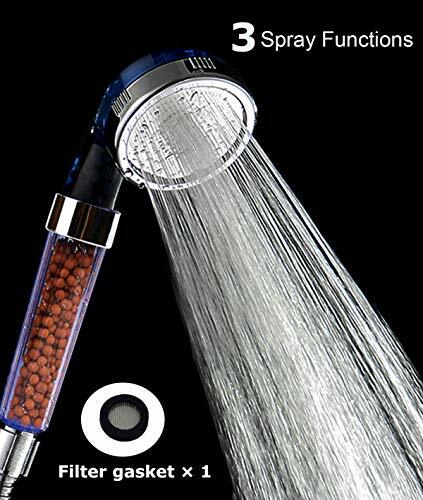 3 Mode Function Spray Handheld Showerheads. Get smoother skin, reduce oil secretion, increase cell viability, improved cleaning effect and hair loss prevention. Saving water and increase pressure. 3 modes: Rainfall/ Massage/ Jetting. Product Warranty 30 days money-back & 12-month warranty. Any questions you have, please don't hesitate to contact us. We will get you back within 24hours. ⚡SAFE and BEAUTIFUL:Built-in water flow turbine generator, using water flow to generate electricity, no battery, very safe, can automatically change red / orange / yellow / green / blue / blue / purple 7 colors, let the shower experience into the dream world, sparkling , make your mood more enjoyable. (it is not influenced by the water temperature). ⚡HIGH PRESSURE DESIGN : The revolutionary micro nozzle technology makes the outlet holes smaller and denser, increasing the speed of the water flow, thereby increasing the water pressure. At the same time saving water up to 30%. ⚡FILTRATION SYSTEM : All-natural Bio-active Stones provide Eco-pure Water Filtration to remove harmful substances . Soften hard water.Keep water's PH Balance.Helps restore healthier and smoother skin, softer and stronger hair. ⚡USE ECO FRIENDLY ABS MATERIAL : with a transparent, see-through design and high-density filter which removable for easy cleaning,recommended to buy two, replace the use suitable for men, women, children and pets. ⚡UNIVERSAL FITTING : Easy installation, simply screw onto any standard shower hose ( Hose not Included ) . Can connect to any standard shower hose easily.Nosame products come with a 12 Month warranty and 30 day money back guarantee. If you have any questions, you can contact us via Amazon and we will be working from 18 to 24 every night. SAVE YOUR SKIN, ENHANCE YOUR HEALTH : All-natural Bio-active Stones provide Eco-pure Water Filtration to remove chlorine,heavy metals,impurities,harmful chemicals, pesticides,rust ,odor and bacteria. Soften hard water.Keep water's PH Balance.Helps restore healthier and smoother skin, softer and stronger hair. ULTRA COMFORTABLE EXPERIENCE : VIKILY shower head With 3 modes: Rainfall/ Massage/ Jetting spray way,each mode is a special shower experience for you;The water is fine dense and uniform that will take the skin feels gentle and comfortable. 100% SATISFACTION GUARANTEED : Easy installation, simply screw onto any standard shower hose ( Hose not Included, recommended purchase B07CYNRKWD ) . Can connect to any standard shower hose easily.Nosame products come with a 12 Month warranty and 30 day money back guarantee. This is a nice shower head filter hard water, the holes the water comes out are very small, which makes the water come out in a very fine mist. This ionic shower heads has many tiny spray holes, which focuses the better pressure into smaller but stronger water streams. Great water pressure feels softer, its like little needles almost, to the finer spray and pressure. it feels great on the skin. The double filter picking up minerals in the filter actually pretty surprised at what it picked up!!! Easy to install, Size G1/2, it actually screwed into existing one without any problems the hose. ENJOY A COMFORT AND LUXURY SHOWER AT HOME-New high pressure ionic shower head,Soft and Good water.No dry skin, No split hair,Get smoother skin. Enjoy Spa experience with high pressure ionic shower head!Unlike other product which have a close to 90 angle, The New Ionic Shower Head has a curved head which allows the spray to flow in a more vertical direction.The injection angle is more reasonable. The head is detachable but no longer separated, Decrease the water leakage coefficient. Package Contents: 1 x Ionic handheld shower head ( Hose not Included ) Including Red balls Gray balls 1 x Mesh gasket 1 x Instruction manual Specifications: 3 modes:Rainfall, Massage and Jet Material:Stainless Steel,eco-friendly PC materials and stones Dimensions:9.25 in* 3.15 in Weight:250g How to maintain the shower head 1.Water rinse or Use dishcloth to wipe the metal panel to clean after twice or 4 times shower which depen ding on the purity of the water. 2.You can also change the Water outlet panel. 3.How often to replace the beads? We suggest you replacebeads every 6-8 weeks according to the different water quality. How to replace the beads? 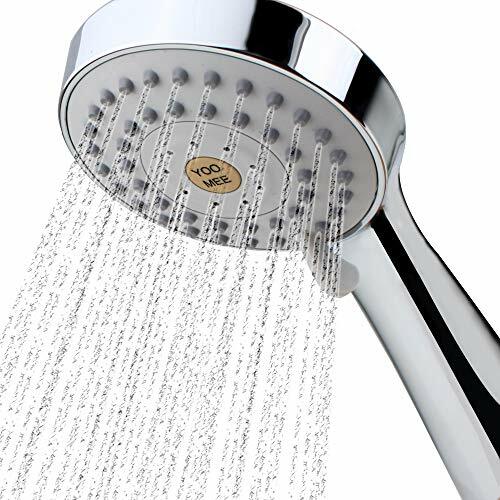 1.Hold the shower head and unscrew the sealing cap counterclockwise. 2.Take out the mesh and the mineral beads. 3.Fill the showerhead with 3/4 beads separately. Don't fill it too full. 4.Don't forget the mesh which separate the beads well. GOOD SHOWER ENVIRONMENT: Stones Bring a good showering environment .Softening it-a Comfortable SPA experience in your own bathroom. HIGH QUALITY DURABLE:Made of eco-friendly PC materials.Features see-through design and Innovative removable design,That's removable for easy cleaning,NO blocking.Head integral design avoids leakage and shedding. LUXURY & HIGH-POWER PERFORMANCE: COMLIFE Shower head adopts the latest innovative technology, meet the highest quality and durability standards. Redefine shower luxury by delivering superior performance and functionality. You can enjoy the rainfall shower experience with our handheld shower head. 7-SETTING PLUS EXTRA-WIDE FLOW COVERAGE: Enjoy 7 settings including Mist, Spray, Spray+Massage, Spray+Mist, Power Spray+Mist, Massage, Power Spray. The flexible rubber design allows easy rub-clean removal of calcium and mineral deposits. This helps your shower head remain clean and clog-free for superior performance. 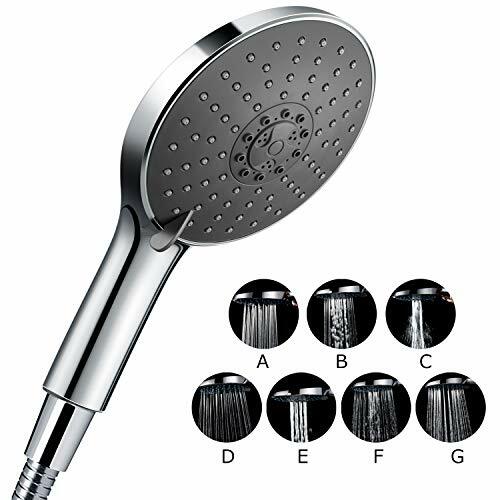 HUGE 6 SHOWER HEAD WITH RAINFALL EXPERIENCE: Compare to other normal handheld shower head, ours has powerful rainfall experience with high-power click-lever dial delivers extra-wide flow coverage with amazing power and precision. TOP QUALITY AND EASY INSTALLATION: Solid brass metal fittings and hose nuts, premium all-chrome finish,ergonomic comfort-grip handle, easy tool-free installation. 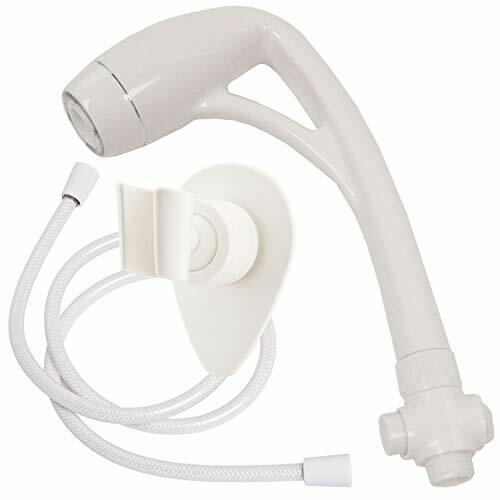 Use it hands-free as an overhead shower or remove from bracket for up-close use. 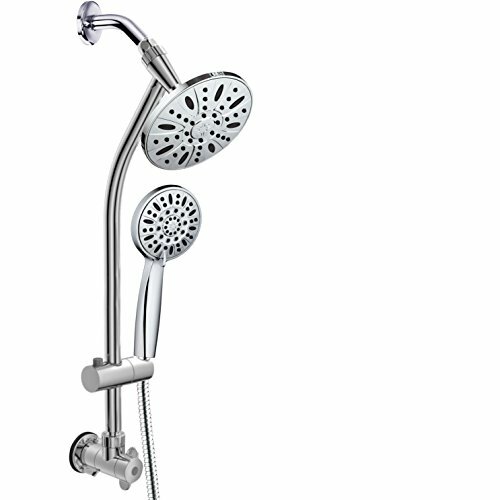 PACKAGE LISTS & WARRANTY: Shower head,1.5 meter stainless steel hose. Enjoy easy tool-free installation without a plumber. Fits any standard shower arm. We provide 60 days return guarantee and 12 month warranty. You can buy it with confidence.